Agnes has reached her early 40s without ever venturing far from home, family or the tight-knit immigrant community in which she was raised by her widowed father. That begins to change in a quietly dramatic fashion when Agnes receives a jigsaw puzzle as a birthday gift and experiences the heady thrill of not only doing something she enjoys, but being very, very good at it. 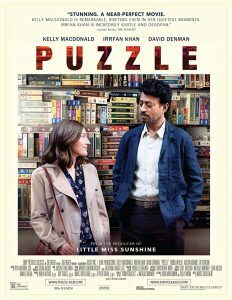 This passion for solving jigsaw puzzles unexpectedly draws her into a new world – where her life unfolds in ways she could never have imagined.